Elizabeth City, NC – The 2015 Chevrolet Colorado will provide Elizabeth City-area drivers with accessible capability when it goes on sale at Performance Chevrolet later this fall. Chevrolet announced today that the 2015 Colorado will be priced from $20,995, including $895 in dealer freight charges. Standard features on the 2015 Colorado extended-cab pickup include a 200-horsepower, 2.5L four-cylinder with direct fuel injection and continuously variable valve timing for strong midrange torque; a 6-speed manual transmission; power windows with express up for the driver; a rear-vision camera with dynamic guide lines; and a locking tailgate. Available options for the 2015 Colorado will include a 305-horsepower, 3.6L V-6 with direct fuel injection and variable valve timing; a 6-speed automatic transmission; OnStar with 4G LTE connectivity and a built-in WiFi hotspot, Forward Collision Alert and Lane Departure Warning; and the GearOn accessory system, a comprehensive solution for organizing and carrying cargo. Other Colorado models will also offer great value. For example, the 2015 Colorado LT crew cab with 2WD and the 5-foot box has a starting price of $27,985, including dealer freight. The 2015 Colorado Z71 crew cab 4x4 with a 5-foot box starts at $34,990. Colorado customers can order either an extended cab or crew cab configuration. Crew-cab Colorado models will offer a choice of 5- or 6-foot boxes; extended-cab models use the 6-foot box. In any configuration, the 2015 Colorado is an easy fit in many parking spots and garages. The short-bed crew cab model is 212.7 inches long, over a foot shorter than a comparable Silverado 1500. Its overall width of 74.3 inches is five inches narrower than Silverado, providing easier maneuverability around town. The 2015 Colorado will arrive at Performance Chevrolet in the fall of 2014. Detailed pricing and fuel economy estimates will be available closer to launch. 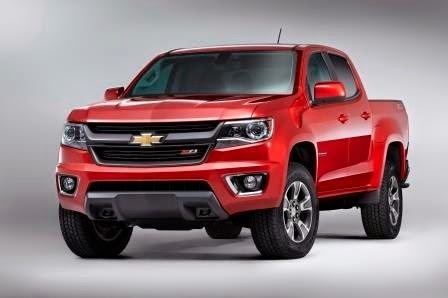 You will be able to enjoy all the features that the all new Chevy Colorado has to offer when it goes on sale in the fall of 2014. Until then, feel free to check out our New Chevrolet Trucks and explore our Used Cars for sale in Elizabeth City. Perry Auto Group has two dealership locations at 1005 W. Ehringhaus St, Elizabeth City, NC, 27909 or 1001 Halstead Blvd Elizabeth City, NC 27909.